Another trip in the Ade Phazy Time Machine. 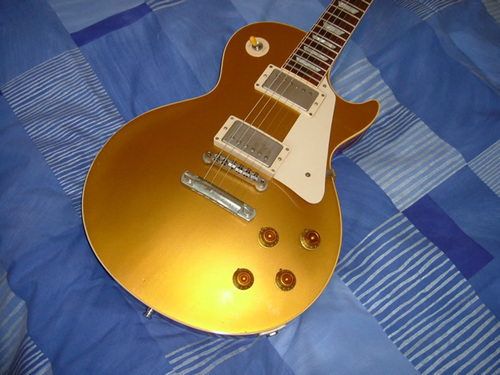 This is a 2001 57 Goldtop reissue, aged by Tom Murphy. Purchased secondhand in March 2004 from Charlie Chandler’s store in SW London. I bought this when I was in a classic rock/blues phase, rather on a whim. This is what I wrote back in 2005 or so. The aging is not too overdone (for my tastes) and I particularly like the aged nickel parts. Plays beautifully – very lively sound – with lots of sustain. The neck pickup shows this particularly well. Being a ’57, the neck is substantial compared to my other guitars, but quite playable. I’ve not yet used it live, prefering the LP Classic or G&L for stage work. I sold it in around 2007 to a local guitar shop. One slight sticking point concerned the authenticity as my guitar slightly pre-dated the Gibson’s Historic Reissue series, with individual certificates, which we know today. 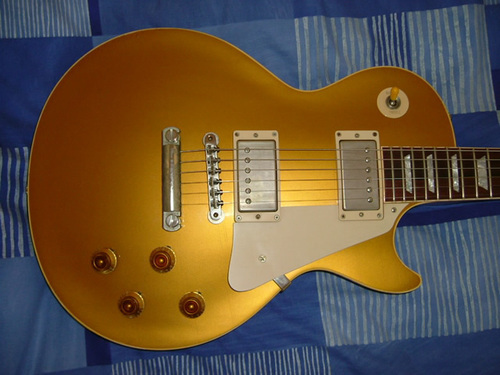 Luckily, the previous owner / Chandler’s had obtained email confirmation from Gibson of the guitar’s provenance. I don’t regret selling it – the neck was just too big for my tastes – but it had a great sound and looked absolutely gorgeous. Check out my Guitar Timeline to see where this one fits into the Ade Phazy guitar history. Photos don’t do justice to this stunning finish and tasteful ageing by Tom Murphy.